If you've looked at the price of baby food lately, you might be surprised at how high it is. It is not only less expensive but also more healthy in my opinion for your child. 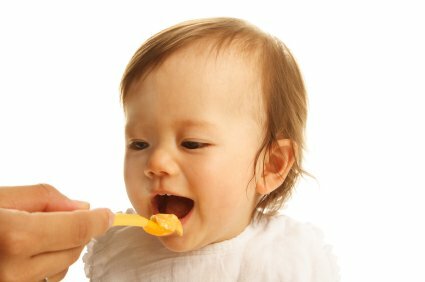 Here are some things you can do to get started making your own baby meals. A food processor. While most people would think to use a blender to puree food for your baby, you’ll probably be sadly disappointed with the results. Blenders not only make a mess, they also make lumpy food your child may not be fond of. Ice cube trays, freezer bags, and lots of space. Unless you want to cook up food for your child everyday, freezing is the way to go. Instead of having to make new, you can just pop it in the microwave and be ready to go in no time. Ice cube trays are a great way to store food and make convenient portion sizes. The first step is to wash and skin fruits and vegetables then cut them up into small pieces. This will make them easier to use later. If skinning and peeling gets tedious, you can always use some prepared food from the grocery store, like baby carrots. This way you just have to wash them and skip to the next step. After your food is done cooking, you’re ready to start processing. Put the foods separately into the [tag-ice]food processor[/tag-ice]. For [tag-tec]pureed foods[/tag-tec], you can leave the processor alone because it may take a while. Later on when the food needs less processing, you may need to monitor it. This is also the point where you would start fruits like banana that don’t require cooking. You could also try throwing in some of last night’s leftovers. The price of baby food is crazy. This post not only helps save money but it's healthier too. We made our own for all our kids. I didn't always freeze it though sometimes I just pureed whatever we were having for dinner. Had to clean the blender (no food processor at the time!) more that way though. Great DIY! Thank you for the Make It From Scratch Entry!